A second station display is available when monitoring the engine shut down system from second station. Models DU-SBH-20-R and DU-SBH-21-R are housed in a square grey display head that blends into helm station aesthetics. Installation is simple as the housing is round (2-1/8in.). 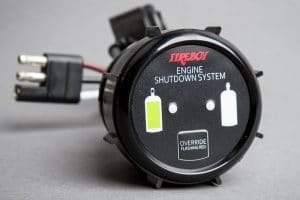 Featuring Water Resistant Display and color coded LEDs indicating engine shut down status. 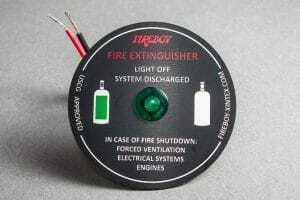 A remote 85 dB horn sounds when the Fireboy Extinguisher is low on pressure or has discharged. Model DU-SBH-20-R is for standard Fireboy systems and is capable with all Fireboy Engine Shutdown Systems. Model DU-SBH-21-R is designed for installation where an auxiliary extinguisher is installed in an equipment room or lazarette area in addition to the an engine room Fireboy System. Features an integrated alarm horn for a simple, single instrument installation. Round or square bezel display head also includes test button and visual lamp. 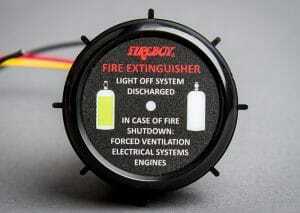 Designed for use with Fireboy Engine Shutdowns. Includes charged/discharged lights, toggle switch to change from normal to override position, and integrated alarm horn. This 2 in. round indicator light has an adhesive back aluminum plate for easy panel mounting. The green warning L.E.D. provides constant monitoring of the system to comply with U.S. Coast Guard requirements for system approval. Standard with all pre-engineered fire extinguishing systems. These items are applicable to MA and GA series only. 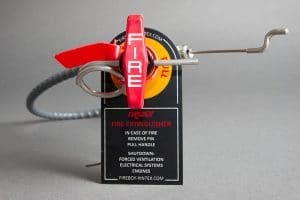 The Fireboy manual feature is a backup for those who prefer the extra measure of control or for inspected vessels who are required by U.S. Coast Guard regulation. Discharge cable kit includes cable, helm indicator light, pull handle, safety pin and safety tie. NOTE: Discharge cables from 54 feet to 100 feet are available on special order. Minimum four (4) weeks delivery. The normal mounting position of the manual discharge cable is at a right angle to the panel for a straight out pull. If space limitations or owner preference call for an angled pull out, the CAA-0285-01 does the job. 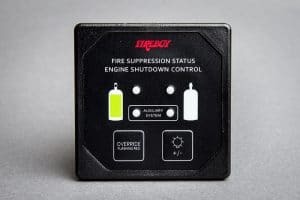 The DRA-1001-01 allows the manual discharge of a Fireboy fire extinguishing system from two (2) separate control stations. Adapter includes six (6) feet of cable, which should be taken into consideration when measuring for dual installation.